You came to Kaidan, escorting a merchant and the gift he carried, a gift meant for a powerful Kaidanese lord. Yet with the gift delivered, and the merchant's daughter rescued, your troubles are only just beginning. Kaidan is cursed and now that you are within its borders you discover that not even death will release you from the Islands' powerful grip. As new horrors continue to present themselves, you must ask, do you have what it takes to survive the Curse of the Golden Spear? 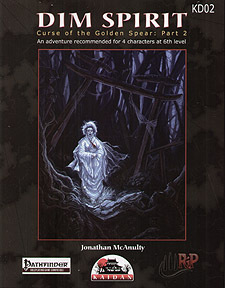 The second of a three part campaign, Dim Spirit is an adventure set in the cursed land of Kaidan and is suitable for a group of 6th level characters. Drawing inspiration from Japanese folklore, and fully compatible with the Pathfinder Roleplaying Game, Kaidan is a land of horror and mystery. In Kaidan demons stalk the land in human form, the dead seldom rest easy, and life is cheap. This adventure continues the story which began in The Gift, introducing players and game masters alike to the cursed realm of Kaidan. An adventure for 4 players of 6th level.